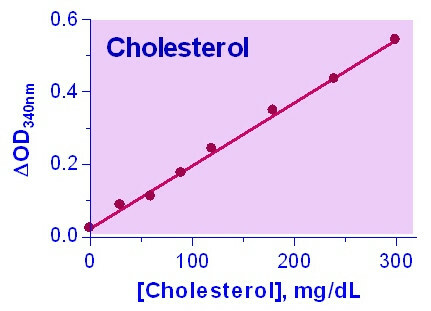 CHOLESTEROL is a sterol and lipid present in the cell membranes, and is transported in the bloodstream of all animals. It is used to form cell membranes and hormones, and plays important roles in cell signaling processes. Elevated levels (hypercholesterolemia) have been associated with cardiovascular diseases such as atherosclerosis; whereas, low levels (hypocholesterolemia) may be linked to depression, cancer and cerebral hemorrhage. Simple, direct and automation-ready procedures for measuring cholesterol are very desirable. BioAssay Systems’ EnzyChrom™ Cholesterol Assay is based on cholesterol esterase hydrolysis of cholesterol esters to form free cholesterol and cholesterol dehydrogenase catalyzed conversion of cholesterol to cholest-4-ene-3-one, in which NAD is reduced to NADH. The optical density of the formed NADH at 340 nm is directly proportionate to the cholesterol concentration in the sample. References Assay: Cholesterol in Rat serum (Pubmed).